Could Gravity win the Oscar for Best Score? 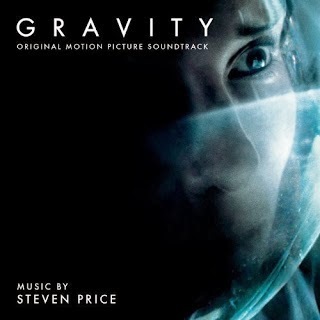 Last on the list of nominees for Best Musical score is Gravity composed by Steven Price. As noted in IndieWire, this is the fave for the Academy Award and it took the Critics Choice trophy. Gravity didn't get the Golden Globe which went to All is Lost, not even in contention for an Oscar. Gravity is less musical in the melodic sense that I tend to fall for BUT in terms of doing what a film score is supposed to do - support the movie by helping to create suspense and build tension and certainly terror in the case of Gravity, I get why some film music nerds love it. Looking at the other nominees Thomas Newman for Saving Mr. Banks, John Williams for The Book Thief, William Butler and Owen Pallett of Arcade Fire for Her and Alexandre Desplat for Philomena, Peter Knegt at IndieWire is predicting Gravity will take the top prize BUT holds out hope for a Desplat fan like me noting Philomena could win. That's if the Academy voters decide they want to find some sort of way to honor the loveable Philomena, which isn't expected to take much home otherwise. Although Philomena has a teeny chance to win Best Adapted Screenplay, 12 Years a Slave is likely, and deservedly so, to win it. Philomena also has no chance at Best Picture - that seems to be down to 12 Years a Slave, Gravity and American Hustle (a light, funny frappe that doesn't stay with you), or for Best Actress for Dame Judi Dench as Cate Blanchett has that neatly wrapped up for Blue Jasmine. So if the Academy does do that weird balancing act they do, yes, a Philomena win is possible. And that would be thrilling, giving me a chance to luxuriate in the beautiful speaking voice of France's Monsieur Desplat. But, I'm keeping my hopes down, as Gravity is apparently more probable. Knegt also thinks that the score for Her SHOULD win but won't and doesn't understand why Hanz Zimmer's 12 Years a Slave wasn't even nominated. Ditto! The nominations and wins for Steve McQueens masterpiece have been all over the place.